I probably should have saved my review of The Tigger Movie for Halloween, seeing as he's all orange and black, and all of the other characters dressed in Tigger costumes. Oh well! Tonight, you and your kids might be out Trick-or-Treating and getting free candy. Any other night, you can go to the library and Trick-or-Treat for free books. You don't have to wear a costume. You do have to bring the books back. But it's at least kind of similar, right? The library is a good place to start figuring out what books will make it into your adoption library. When I was training incoming foster and adoptive parents, I would usually stop by the kids' section of the Pasadena, CA library a few days in advance, and stock up on books to pass around during the training. Check out your library's website now, and do a search for adoption, or just stop in and ask the librarian to point you in the right direction. In the meantime, here are two good books to start your search. They each affirm that adoptive families are families because they meet a child's needs and because they love the child. These books are also very special because they appropriately acknowledge the role of the birth parents. adopt an infant from an orphanage. The woman adopts the infant, comes home, introduces the infant to her family, and then enjoys a quiet first night. Adoption Message: The infant was missing a mother, and the mother was missing an infant. The adoption occurred, and everyone was happy. The adoptive mother cries for the birth mother “who could not keep you” and promises that she and the infant will always remember her. 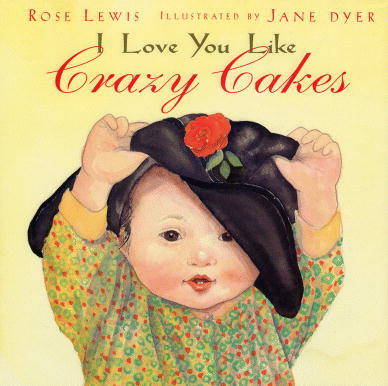 Recommended for: Young children who have been adopted, especially those who were adopted as infants; the book introduces the concept of adoption, and acknowledges the birth mother as well. Although the book is based on a story of international adoption, it can translate to domestic adoption as well. 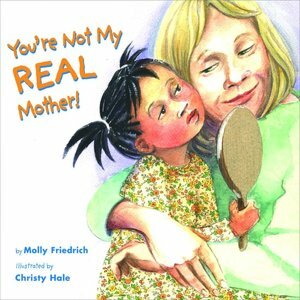 You’re Not My Real Mother by Molly Friedrich, is the story of a young child telling her adopted mother, “You’re not my real mother.” The adoptive mother starts listing things she does that only a real mother would do. The adopted child asks why they do not look alike, and the adoptive mother explains that she is not the child’s birth mother, but is grateful to the child’s birth mother every day. The child then lists things the adoptive mother does that only a real mother would do, and finally concludes that the adoptive mother is her real mother. Want more books? Check out my growing list of adoption kids' books and see what ones you'd like to read next! Most libraries also carry movies. While you're there, see if they have any of the ones I've reviewed on my adoption movies list. Who says entertainment can't be free?